We are constantly improving our SharePoint tools, and every once in a while releasing packs of product changes and fixes! So far, nothing new here. What could come as a surprise is that more often than not our customers don't fully understand the direction we are taking our SharePoint solutions in, and they don't realize the maximum potential the new features have. There is so much new stuff that people miss out on a lot. That's why we are starting this new blog series, commenting on our products' release notes, explaining why we make each change and how we envision our SharePoint and Office 365 tools being used. Here's the first one! JungleMail for SharePoint already received this update, but now the latest version of our newsletter tool arrived for Office 365. We totally re-envisioned JungleMail. It is now easier to use than ever, looks stunning and works super smooth with the latest newsletter technology principles. We could sum it up by saying that this update attempts to reduce, and almost eliminate the features' gap between our newsletter tool for Office 365, and its version for SharePoint on-premises. Some of the features listed below have already been available online for quite some time, but we were waiting for another few important ones before we released these notes. Now JungleMail for SharePoint and JungleMail for Office 365 share the same visual design and user interface. We focused on very minimalistic visuals and a simple to understand structure. We listened to you, our users, and reimagined our entire user interface. We believe it is something you have to see and use, and then you will love it. We organized all product features according to the 5 steps of creating a SharePoint newsletter campaign. All of these steps are now found at the bottom of the page for easy navigation: add SharePoint recipients, create templates, edit content, preview individual emails and adjust final settings/send. At the top of the screen, you will find the other management pages: Email Templates, Reports, and History of sent campaigns. Fun Fact: One of our favorite parts of the whole design is the tree leaves at the top right, next to JungleMail's logo. It brings some color and reinforces our SharePoint jungle theme. Previously, if you wanted to use a part of a SharePoint list as email recipients source, you could filter its users using a SharePoint view. But if you wanted to do the same with an Office 365 group, you couldn’t. So we changed that. This feature is probably why we initiated the whole JungleMail redesign project. Bringing to our tool such an easy way of building newsletters in SharePoint would improve our product's user friendliness so much that made all effort worth it. We wanted to give our "not so familiar with HTML code" users an alternative to building beautiful emails in Office 365 too. 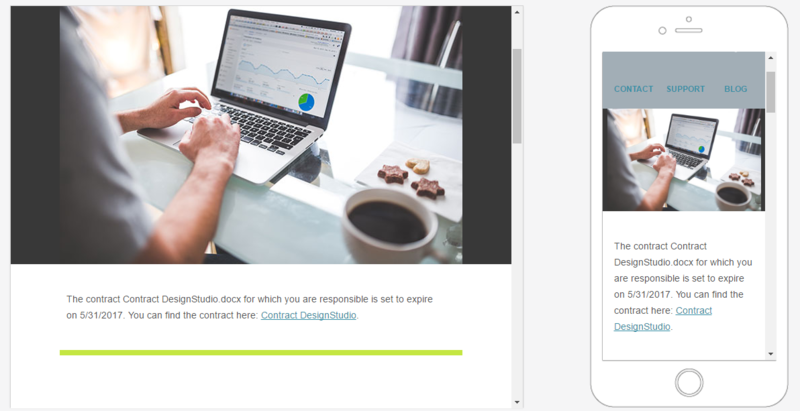 Now, besides the already existing Rich Text templates, you can create and edit email layouts with a drag & drop editor. With it, anyone can create beautiful SharePoint emails. Drag and drop blocks, sections, images, and texts straight into your email template. Also, we wanted to make the experience of editing email templates a more comfortable one, providing users options to move information around, duplicate it, and replace it within a few clicks. All emails you create in JungleMail 365 are fully responsive. This means they will look good on whatever device they are opened. You can even manage your email campaigns on the go, right from your own tablet or phone. Ever since the first release of JungleMail, you could use Office 365 images to build emails. But, for you to do that you would need to upload the image to Office 365, copy its URL address and paste it into the email HTML code. Like we've mentioned before, not all our users understand how to work with HTML, so we've changed that. Now, you can access JungleMail's image gallery straight from the Drag & Drop email builder. Upload and choose which images to use while you build your email campaign, with no coding involved. All you have to do is drag and drop. We wanted to make it easier for users to be able to resize their uploaded images before placing them at the email templates. The option we went with was to implement an in-app image editor, that could not only resized images but also apply image effects, filters, frames, color and lighting adjustments, stickers and so much more. You can access the image editor from the Image Gallery, or from the Image Block settings, by clicking on the "Edit Image" button . Nowadays more emails are read on mobile than on desktop email clients! So we needed to adapt to this new demand. The new JungleMail Drag & Drop email editor allowed us to include a phone preview of email layouts, showing you a real representation of how your content would look on the mobile displays. Access the mobile preview from the drag and drop email builder, clicking on the top right button , or move to the "preview" step of building your campaign. By using Dynamic Blocks and Sections you can import SharePoint content into emails with JungleMail. These dynamic sections and blocks are simply parts of your email template connected to specific SharePoint lists giving you access to its columns and metadata. You can make any part of your email dynamic by turning this feature on when needed. When JungleMail sends the campaign it mail merges the dynamic section with the requested content, customizing each email according to conditions, duplicating the block/section when required, allowing you to have different email results for different contacts. It's awesome. Result: An email with an organized list of news articles, separated by news topics. The main purpose of JungleMail is to save time building and sending email campaigns in SharePoint Online. So it wouldn't make sense if you had to rebuild recurrent campaigns every time you need them being sent. JungleMail 365 version 3.0 allows you to make email campaigns recurrent. Build a template and set it to be sent daily, weekly or monthly. Work on it once and let it run for as long as necessary. Recurrent campaigns are displayed at the History and Reports page as a group with combined and individual performance data. Advanced Automation: Use this feature to achieve advanced results. Drag in Dynamic Sections and Blocks and link them to your SharePoint lists. JungleMail will then query these lists using view filtering and additional conditions to populate your email. Schedule your campaign to send out daily, weekly or monthly. JungleMail will process your future email campaigns for you. Sit back and monitor the results. One of the features that were requested most by our customers, was the ability to use JungleMail 365 to send reminders in SharePoint Online/Office 365. They wanted to notify Office 365 users about overdue tasks and approaching meetings and deadlines. So that's exactly what we've done. Now you can use dynamic blocks to set up conditions and let JungleMail send emails only when those conditions are met. If you want to achieve this "automation jewel" please follow the sending reminders in Office 365 tutorial. We know that campaign analysis is one of the most important factors in running successful communication campaigns. That is why we revamped our analytics dashboard. It is now easier than ever to monitor link clicks, email opens, content interaction and even to track on what device emails were opened. Opens & Clicks statistics by the hour and weekday; Reading environment (Phone, Desktop, Tablet); Click stream/Navigation path; Top links statistics; Export data sheet to Excel/CSV. JungleMail 365 feels, looks and works better than ever. Already a JungleMail subscriber? Update now! New to JungleMail? Download the full free trial now on the Office App Store.